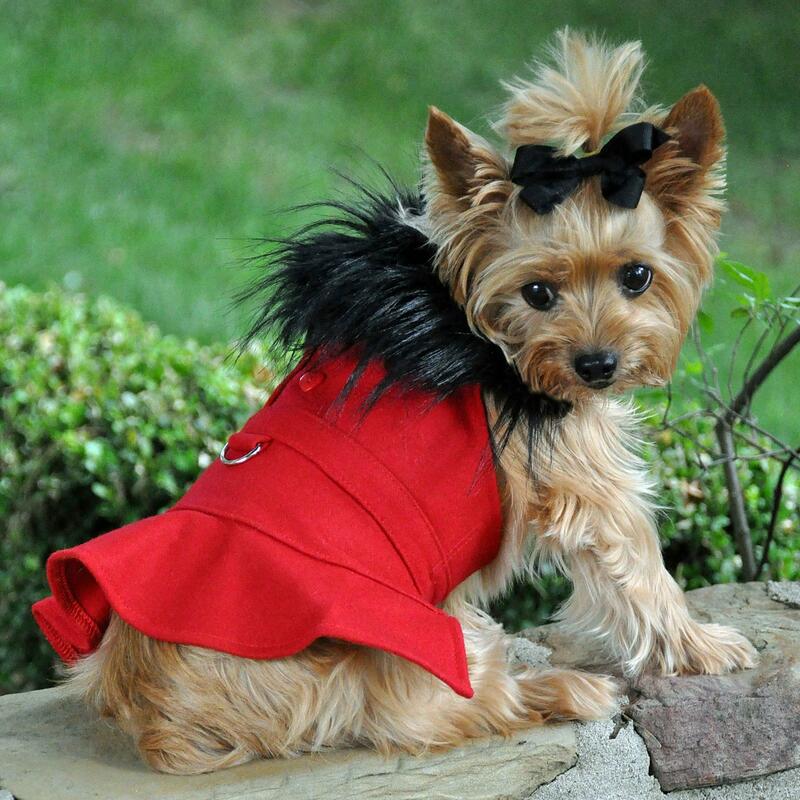 Dogs will look classy in this stylish Wool Fur-Trimmed Dog Harness Coat in Red by Doggie Design! 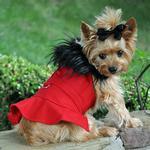 Dogs will be sure to impress with the Wool Fur-Trimmed Dog Harness Coat in Red by Doggie Design. Reclaim the elegance of years gone by with this classically-styled wool coat with designer details. The fabric features a sumptuously soft, thick wool blend that will keep your dog warm during the coldest weather. This elegant dog coat is lined in an ultra-rich satin. A thick, plush black faux fur collar tops off this wonderfully warm dress coat. The coat has beautiful lines and expertly-placed seams to fit and flatter. The tiered skirt is cut on the bias for a feminine look that is classic and understated. The heavy-duty D-ring at the waist makes this dress coat double as a comfortable and safe harness. Doggie Design has included a matching wool leash so your pup is perfectly polished from head to paw! Putting this gorgeous dog coat on is a breeze. Simply lay the coat across your dog's back and fasten the heavy-duty touch fastener at the neck and chest for the perfect fit. Your dog will find that it is comfortable yet substantial, yet it won't impede your dog's movement. We absolutely adore this dog dress coat! It will remind you of the one you might have worn to a holiday event, a fancy brunch, the theater or Sunday School. It's beautiful alone or worn over an elegant winter dress. Thankfully, the large, wide band of touch fastener gives adjustability should your dog wear this coat over other clothing layers. Wool Fur-Trimmed Dog Harness Coat by Doggie Design - Red Customer Photos - Send us your photo! Red and black wool and fur jacket. I love it.